Issue #191 • April 15, 2014•Sold Out! You can tell how fresh the Whopper is by the way Claire’s fingers dimple the bun and the joy that wells up in her eyes as she bites into it, cheeks rippling in slo-mo, pupils dilating with a pleasure so intense it’s like Burger King has ground up dreams and mixed them into the beef for flavor. She’s wearing a gray skirt suit and white cotton blouse—she’s in sales or marketing or PR or something—and sitting on a newly painted park bench against the backdrop of a blue-ribbon day, not even a whisper of cloud above her. The intimation being that she’s a young professional focused on enjoying her lunch break, as if eating a Whopper for lunch is something any young professional woman would want to do, as if people still took lunch breaks and ambitious young women in skirt suits had the metabolisms and confidence to enjoy eating a hamburger solo, in public, without fear of judgment from colleagues or bloggers or other less charitable passersby. Jonathan Durbin’s writing has appeared in Interview, Travel + Leisure, Bon Appétit, Esquire, Vice, and elsewhere. He is also the editor of nycgo.com, the official online guide to New York City; a contributing editor at Paper; and a fellow in the Writers’ Institute at the City University of New York. He is working on a novel and finishing a collection of short fiction. This is his first published story. JD: It grew out of a conversation I unintentionally eavesdropped on. One night last summer, as I was walking home from the subway, I passed a couple of women on the street. I overheard one telling the other something like, “No good story ever started with, ‘Well, I was eating a salad...’” She used this terribly sarcastic tone, as if she thought it was absurd that anyone could think it would be okay to start a story by describing leafy greens. To me, that sounded like a funny way to start a sad story, so I took it as a challenge. As it turns out, she was absolutely right. At least, I haven’t found a way to make it work. The salad line didn’t make it into the piece, but many things the salad inspired did. JD: I knew what would essentially become the last line almost from the outset, and I had a strong idea about what feeling I wanted the story to convey. So I got lucky there. But finding a way to get to that last line was difficult. The emotional mix I wanted didn’t always jibe with the story’s stranger elements, and that made for a weird read. It spun out of control a lot. I came to the story with the idea to write it so that it moved in time from past to present, but only using the present tense. Negotiating gaps in time, which also become signifiers for differences in perspectives on the relationship between Claire and the narrator, became complicated. WA: How did you come up with the title? Want to share any runner-up titles? JD: It’s half of a line of dialogue from Scrooged. The full version is, “Claire, the whole world, the whole world, Claire.” Bill Murray delivers it at this very sweet moment, just as his character gets back together with his ex-girlfriend, played by Karen Allen, introducing her on a network television set to cameras taping a live Christmas Eve special. I’ve always loved that line. It echoes. I usually have alternate titles, but in this case, I didn’t. It fit the idea too cleanly. WA: This story is suffused with insidery details of Los Angeles and the world of aspiring actors. Have you ever done any acting? If not, what kind of research was involved? JD: Never acted—at least not since a run of The Real Inspector Hound back in high school. But I’ve known a few actors, written about film and television for magazines, and, shortly before I started “Claire,” I had been working on several different film scripts. So I had a solid baseline. The rest of it was imagination, extrapolation, and research online, trying to make sure I got my facts straight. My apologies to any aspiring actors who may be working at Urth Caffé. I’m sure your cappuccinos are great. WA: I noticed the narrator doesn’t have any lines of direct dialogue until the final scene. Was this a conscious choice? JD: Right. My thought was that if I withheld direct dialogue from the narrator until the final scene, it would help highlight the shift in him from inertia to action, which is an important part of his character arc, along with the distance that had grown in his relationship with Claire. But the whole story is very much in his voice—in places, it’s almost like he’s talking to himself—so, in a sense, the entire thing is one long piece of dialogue. 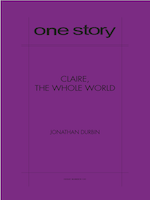 WA: Is “Claire, the Whole World” more or less the story you set out to write, or did it change in the process of your writing it? JD: About the same, although it took on much more depth in the revising process, thanks to some stellar editing from the One Story team. The overall thrust of it never changed, but I was surprised to see how layered it became when I focused on some of what I thought were the story’s more minor threads. Turns out they weren’t minor at all. Initially, I also had the narrator writing lists into the story: shopping lists, audition lists, lists of debts he owed—super-fun, that last one. But I cut that idea early on. The lists were pushing the story in a direction it didn’t want to go. WA: Are the TV commercials in the story based on real commercials? JD: No, although I feel like the action described in them is fairly typical for the kinds of products being advertised. That said, I doubt any agency on the planet would approve those as creative executions; they’re too archetypical. But I felt the archetypes served my aims here. No real commercials were harmed during the making of this story. JD: It was fairly quick for me: I wrote the first draft in about a month. Of course, that first draft is almost unreadable. I went back and reread it recently, and man, is it terrible. I’ve been revising it for the last six months. JD: I’m working on a novel, set in the not-too-distant future, that deals with notions about the reliability of memory. It’s got a sci-fi bent to it. And I’m reworking a series of stories—around ten or so—with the idea of putting them into a collection. JD: I’ve gotten plenty of writing advice, but maybe the most useful I’ve found is something Kurt Cobain once said of music. He said—paraphrasing here—that anything was allowed, “so long as it’s good and has passion.” I like to keep that phrase in mind when I’m writing, because it sounds easy to do, and that’s reassuring when I’m struggling to finish a story. But it’s also deceptive, because it sets the bar very high—it’s hard to create something that’s both good and has passion. But that’s got to be the goal. Why strive for anything less?